Restaurant floor plans should create a quality dining experience for your customers and a positive work environment for your employees. Whether you already started or just planning to open a restaurant, first you have to design the restaurant floor plans with seating area, kitchen, and bar etc. 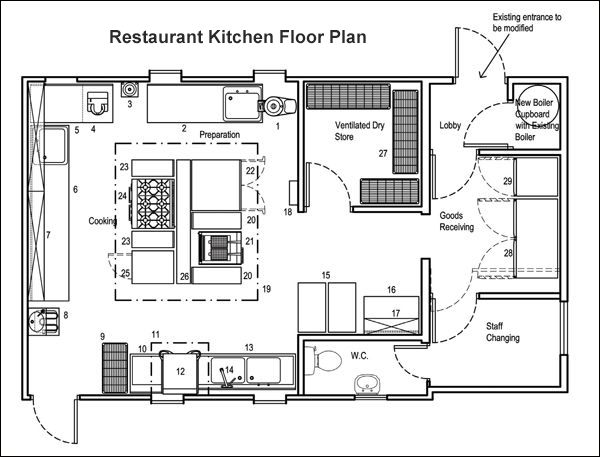 Restaurant floor plans should be functional and practical to increase staff productivity and customer comfort. The idea behind the restaurant should determine the materials, the flow of the spaces and the placements of walls. Professional Restaurant Floor Plans with Cad Pro. You don’t have to be an engineer or artist to create great-looking restaurant floor plans. Cad Pro helps you align and arrange every table, chair, and bar perfectly. Plus, it includes textures for flooring, countertops, furniture and more. Share Your Restaurant Floor Plans Online. Share your restaurant floor plan in a variety of common graphics formats, as a PDF, or export them to any Microsoft Office application in one click. 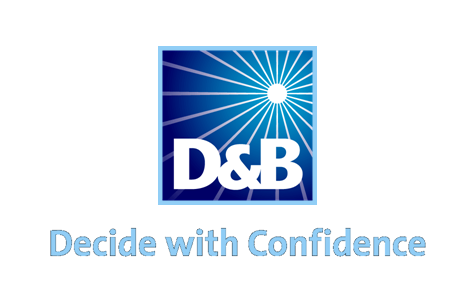 Cad Pro works with popular services such as Dropbox®, Google Drive™, and OneDrive®. You get ready-made visuals for tables, chairs, kitchen and bathroom fixtures, lighting fixtures, wiring, plumbing, HVAC, security systems, plants, landscape elements, and more! Imagine a place for socialization, comfort and memories. Restaurants are more than just eating factory. Thinking long before the design and menu, don’t forget about safety, ergonomics, and profitability. Each customer should see good food service architecture from every seat and a comfortable atmosphere and appearance of the restaurant. Besides designing a new restaurant, accurate restaurant floor plans will help to renovate an existing space, host an event, or document emergency evacuation plans. 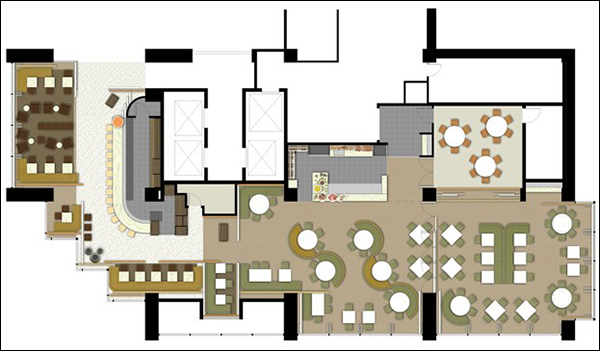 Cad Pro is great for successfully planning your restaurant floor plans. Come up with a tentative plan. As part of the building permit application, you will have to describe, and draw your plans. It’s a very good idea to design a set of drawings/blueprints that will provide detailed information for your restaurant building project. You can choose to hand draw your plans or we recommend that you use a good drafting software for designing your blueprints. Drafting software allows you to quickly modify your designs if required. Cad Pro is an excellent inexpensive drafting software program.